Nakul Saran serves as Head, Special Projects & Sustainability at the Tata Trusts. In this role, Nakul leads the organization’s climate, energy and environment work, implementing and funding sustainable and scalable solutions that help both people and nature thrive through India. Most recently, Nakul was Vice-President, Fish Forever at the global conservation organization Rare. Nakul was responsible for scaling Fish Forever, a nationally-scaled global effort to place power directly in the hands of communities to restore the fisheries to which their livelihoods and food security are so intimately linked. Under Nakul’s leadership Fish Forever grew to span five countries and over 100 coastal communities. 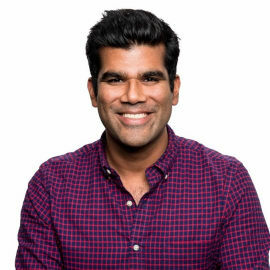 Prior to joining Rare, Nakul spent seven years at the global management consulting firm McKinsey & Company where he led the Oceans & Fisheries service within the Sustainability & Resource Productivity Practice. Nakul was also a part of the Economic Development and Social Sector practices through which he served national governments, multilateral & bilateral agencies and major philanthropic organizations on improving their impact through improved implementation and financing models. Nakul holds master’s degrees in Ocean Engineering and Engineering Management from Florida Institute of Technology, where his research focused on developing a rapid classification tool for coral communities using multispectral acoustics. A passionate lover of oceans, Nakul’s formative years in Mauritius cemented his lifelong commitment to help protect them and life dependent upon them. His interest in deeply understanding and experiencing the environmental world in a personal way has taken him around the globe to over fifty countries. When not at work, Nakul can be found on a beach, sailing or diving.